Yesterday confirmed that whatever hex Fabian Cancellara was under in 2012 has left him and is making Tom Boonen’s year one to forget. Last year, Cancellara fell while going through a feed zone (Geraint Thomas suffered a similar crash yesterday) while Boonen won the first running of the Ronde on it’s new parcours. Cancellara had demonstrated his form at Milan San Remo and had proved imperious at E3 Harelbeke, riding away from the field with kilometres to spare. Much of the speculation ahead of this years classics was whether the tactic of attempting to ride rivals off his wheel would work with Peter Sagan in particular and riders like of Sylvain Chavanel looking in good touch. 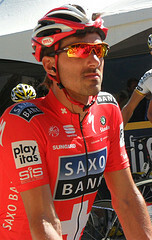 The relative strengths of Cancellara’s team Radioshack verses OPQS, Cannondale and even Sky in the classics was also questioned, with Cancellara often having no teammates to work with as races reached their closing stages. His performance at E3 probably made him joint favourite with Sagan ahead of the Ronde. Boonen, who was bidding to win for a record third time has shown flashes of form this year but nothing resembling his results in 2012. Eurosport were putting the editorial direction if not their money on a Boonen Cancellara face off. When the snooker from Bejing had finished overrunning the plan was to show extended interviews with both riders before cutting to the live feed. Like many great plans it unravelled in the face of a tweet from Boonen’s girlfriend announcing that he was already out of the race with less than 20 k’s completed. There was ample footage of the aftermath but with no other riders apparently involved, during the race at least it was unclear how it had occured. As hasty re-edits were implemented we at least enjoyed Cancellara rhapsodising about the race. While he appeared quietly confident, you could sense Boonen’s realism about his chances even in a shortened interview. Using this parcours for the second time the peloton would climb the Oude Kwaremont and the Paterberg three times and as the leaders approached for the final time the critical moves were poised to take place. The intervening kilometres had been characterised by a surprisingly strong showing from Radioshack with Hayden Roulston doing some monster turns at the head of the peloton. There was a breakaway for much of the race but this was never more that a few minutes away. Up the final climb of the Paterberg it was now head to head between Cancellara and Sagan as their rivals in leading group ran out of legs. As the outside bets prepared to argue over the scraps Cancellara and Sagan began their final ascent of the Kwaremont. Those hoping for a Sagan win hoped that the signs that fatigue was setting in over the crest of the Paterberg was illusory. As both riders hit the final third of the climb those hopes were dashed as Sagan faltered as Cancellara picked up the pace. What had been 30 seconds at the summit was over a minute at the end as Cancellara the time trialler delivered an emphatic victory, slowing to a comparative crawl as he crossed the line. Sagan had a job on his hands to retain his podium position, working hard with eventual third place finisher Jurgen Roelandts of Lotto. Lotto could feel pleased with their race. A rider in the break all day, joined by Andre Greipel and as those two faded late on the faintest chance of a solo win for Roelandts. Sky’s fabled classics squad failed to fire again and it’s hard to see things improving at Paris Roubaix on Sunday. The post race analysis was dominated not by Cancellara’s victory but Sagan’s unfortunate arse grab of one of the podium girls. Cue a lot of hand wringing about sexism in the sport. There’s clearly lots to discuss at the inequalities between men’s and women’s professional cycling but Sagan’s actions don’t merit becoming the metaphor for this. As for Boonen, he would be forgiven for writing off his season now. Reports suggest that he didn’t sustain any broken bones but with it looking unlikely that he will be able to put in many miles ahead of the weekend it’s hard to see him beating his ‘other’ record at Paris Roubaix on Sunday.